Returning large animals to certain environments could help reduce the impact of fire in an increasingly flammable world, according to new research led by the University of Tasmania and the Royal Society in London. The University’s Professor Christopher Johnson, alongside Professor David Bowman, is one of the lead authors of the paper, with input from North America and South Africa. Published this week, the paper in Philosophical Transactions of the Royal Society B forms part of a special theme issue called ‘Trophic rewilding — consequences for ecosystems under global change’. Professor Johnson said the rewilding of animals was popular in Europe and America, but could also have a positive impact on Tasmania’s eco-systems. “Returning the landscape to a wild condition doesn’t consist of just predominately locking it away,” Professor Johnson said. This in known as trophic rewilding, and the paper argued that it could reduce the impact of fire globally. “We’re seeing an increase in the impact of fire in many parts of the world. The main reason for this is climate change, but the evidence shows that loss of wild herbivores is also very important,” Professor Johnson said. “The fire seasons are getting more extreme in places such as California and the Mediterranean, and the large herbivores that used to eat a lot of plant material and return it to the soil have disappeared. This changes the landscape and results in the accumulation of more fuel for wildfires. Professor Johnson said there were findings that could be applied to fire management in areas such as Hobart. 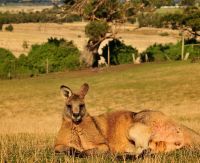 “It’s clear that areas grazed intensely by large animals, such as kangaroos or maybe even deer in Tasmania, can function as quite effective fire breaks,” he said. “If you’ve got a certain fraction of landscape treated in that way by animals, it can have a big effect on reducing the probability of a fire that will sweep across the entire landscape. Professor Johnson said an example of bold and courageous rewilding could be the reintroduction of hippos and elephants into some parts of Europe.